Because sometimes, finding a new job is the easier part. Simple – at the bottom of this article, leave a comment about new jobs. Written by a leading expert with proven expertise as a practitioner in this area. The ‘In a week' approach provides clear structure and added motivation. Livened up with unique cartoons, which form part of a highly visual approach. Christine Harvey is a business speaker, broadcaster and author. She delivers training for UK clients including Sony, British Gas, Lloyds Merchant Bank, Shell, Standard Chartered, and the IoD; and international organisations including Holiday Inn, Philips, General Electric, Singapore Institute of Management, Hitachi, IBM and the US Air Force. She was the first woman and the first American to be Chairman of the London Chambers of Commerce. 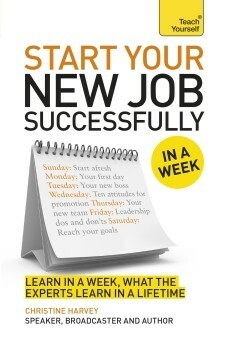 5 free paperback copies of the recently-published Start Your New Job Successfully in a Week (which has a list price of US$12.00) are available to be won, including shipping & handling to wherever you are in the world. As always: leave impressive comments! The more impressive your comments are, the more chances you have to win. Comment often. Feel free to influence the choice of winners by leaving more comments in support, or getting your friends to do so. You can comment as many times as you like, but you can't win more than 2 copies of the book. Make sure you know exactly what your job is going to be before you start. Ask you potential employer in depth about the tools, job, and expectations before you start. I’m a recruiter and I observe that many people don’t make it easy for me to contact them via Linkedin. You need to know that other than your first level connections, others can not see nor access your actual email address or phone. Making matters worse, some people have their “InMail” from Linkedin go to an email address they no longer use. My tip: Be sure to list your actual email address and phone number in your LI profile so that recruiters and hiring managers can easily contact you. You can’t imagine how many people contact me months after a search has ended asking if the job is still open, saying that they “just checked their old email address and found my InMail”. I got my most-recent job through connections. I also got my second-most-recent job through connections. I have to use connections because when I apply through normal channels, HR dismisses me for being over-qualified. Tip: I have different CV versions for different positions, but actually updating my CV (and in Hebrew too!) for each submission is rough on the formatting. I attach a cover letter in HEBREW for the person scanning the incoming CVs that highlights and closely matches the ad – in as few words as possible. It is part of the CV file since many online submission sites have no field for a cover letter / comments. I’ll NEVER FORGET how I was interviewing at a company and there was such a sense of urgency, but at each stage there was a 1-2 week wait to move on to the next interview. High pressure environments can be frustrating when materials need to be delivered ASAP but the top decision makers keep changing their minds about what they are looking for, what’s best for a show, etc. Ask about staff turnovers. There is a very high turnover rate at my current job as a counselor. It makes my job more complicated because other organizations are resistant to making long term plans for mutual clients. Never underestimate the value of your network. I found my current job from a key connection. After changing careers and working for a national brand for five months, they laid me off. My former manager at this national brand connected me with my current company, and I have been here six years this month. Every single connection is important! Thank you all for great comments, especially the insight and tips. The winners are: Chuck, Jon, Kate, Noele and Andy. I’ll be in touch shortly about how to claim your prizes.